If there’s one thing we really love here at Oneshi Press, it’s gorgeous art. And if there’s one thing we love doing with gorgeous art, it’s coloring! That’s why we’ve teamed up with the amazing Jacey Chase—a brilliant artist, repeat Oneshi Press contributor, community member, and all-around fabulous human—who runs a monthly coloring contest on their Patreon! With our powers combined, we’re inviting everyone else who loves gorgeous art and coloring to join the fun! The current project is Jacey’s original image from the world of PACK! Members of Jacey’s and/or Oneshi Press’s Patreons can download the original line art, then color it to their heart’s content. Digital or traditional! Photoshop or colored pencils! Whatever works for you, works for us! You can also share it on social media with the hashtags #jaceychasecolor and #oneshipress just for funsies! Whatever you do, make sure it happens by March 2nd. Shortly after that, we’ll get together with Jacey to evaluate and choose a winner! Our favorite color-er will receive a free, signed copy of PACK #1: Humility! 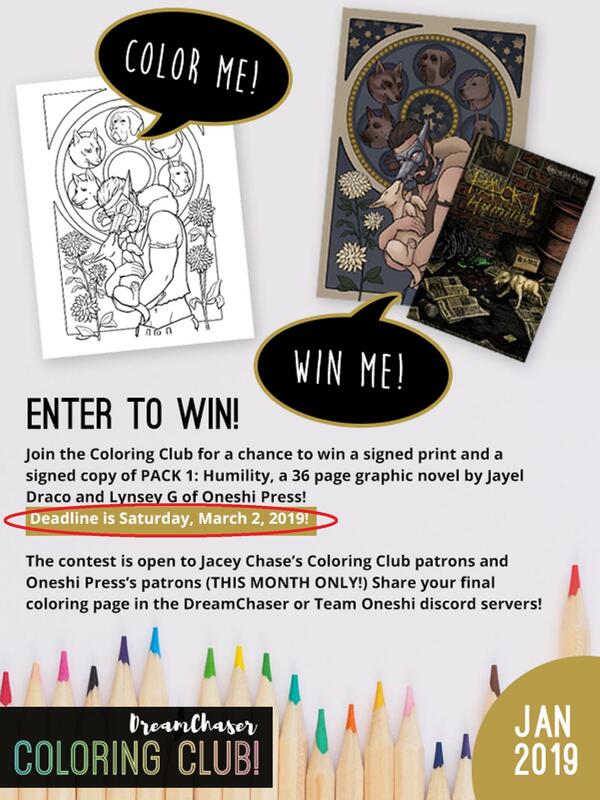 The contest is only open to Oneshi Press Patreon supporters and Jacey Chase Patreon supporters at the Coloring Club level or higher! So, ummmm, sign up righ the heck now!